This Andy Goldsworthy installation, “Drawn Stone,” at the de Young is from 2005, but I didn’t have a blog back then and I’m generally slack about going to museums, so it’s just now that I’m checking it out and posting about it. Goldsworthy’s stone installations are always interesting to me, the way he often manages to (knowingly) break the rules about stonework while still remaining very attentive to and respectful of the craft. 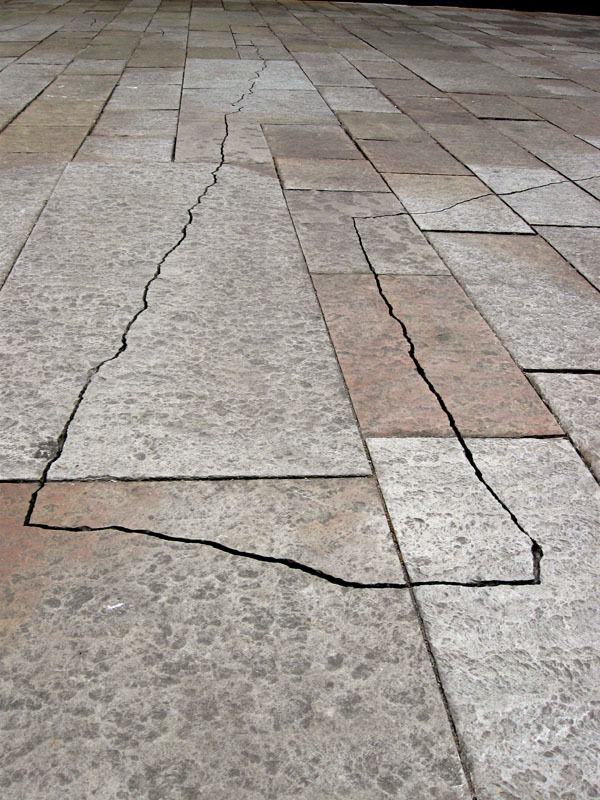 For instance, with “Drawn Stone,” the entire focus of the installation is a crack that runs through the sandstone pavers and slabs of the museum’s entrance. 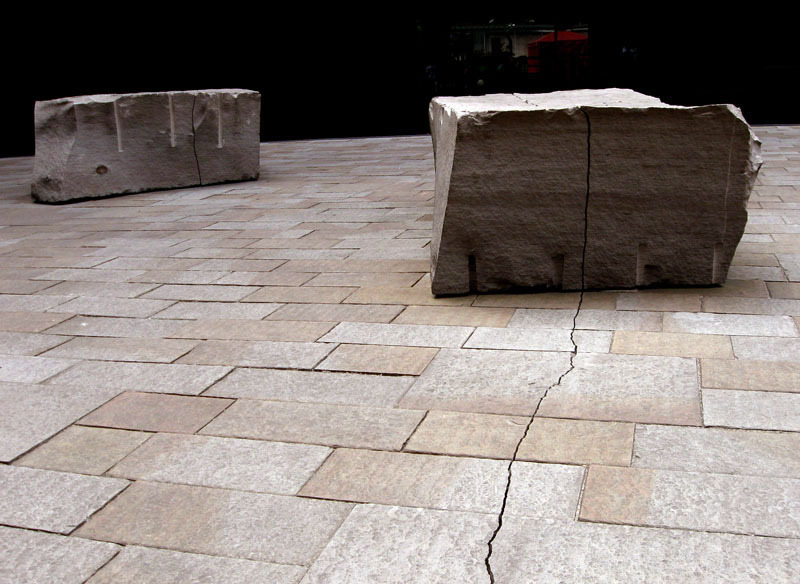 Installing a cracked paver is considered poor form, but he’s reveling in it, making it the entire focus of the installation. And in fact, it must have taken a lot of extra effort to crack the pavers and then match them up, so he even earns bonus points for doing something that would normally be frowned upon. Pretty bold. The installation was originally named “Faultline,” but Goldsworthy changed the name along the way. I don’t know anything about the reasons for the change, but it seems like he somehow found out that Californians don’t really like earthquake-themed art, and so he decided to keep that aspect more low-key, the way Californians like it. 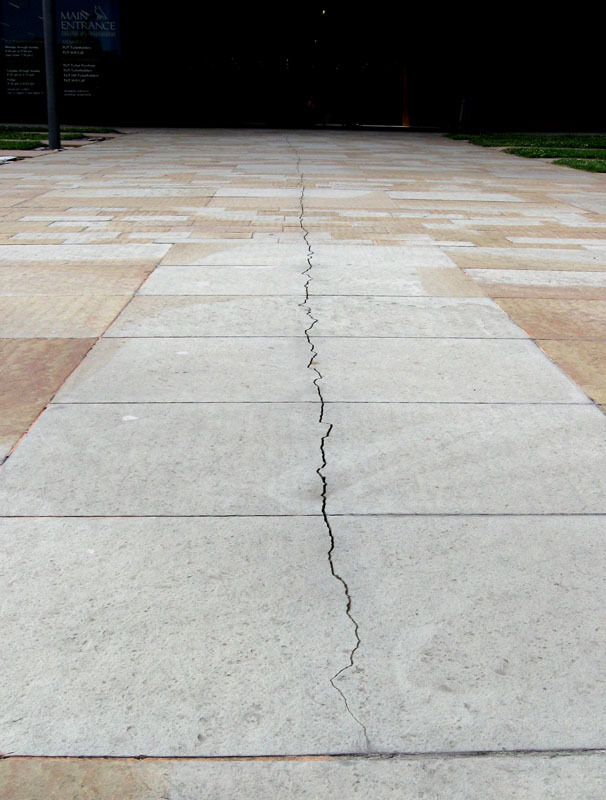 In this case, it’s totally appropriate to have an earthquake theme — the new de Young was actually built because an earthquake made the old building unsafe — but it’s more in keeping with the local aesthetic to keep that aspect out of the title. And the piece is overall fairly subtle, anyways; several people didn’t notice it until I took out my camera and started snapping photos. Goldsworthy is always an interesting talker, and KQED’s website has a 2005 segment about the installation with him talking about learning to break pavers (the best way is to just whack them with a hammer) and other aspects of the piece. The museum website has his artist’s statement along with a photo of him on top of one of the slabs, holding a sledgehammer, with the wedges and feathers still in the slab. It’s a fair bit of work to split a slab that big, but it must have been satisfying. 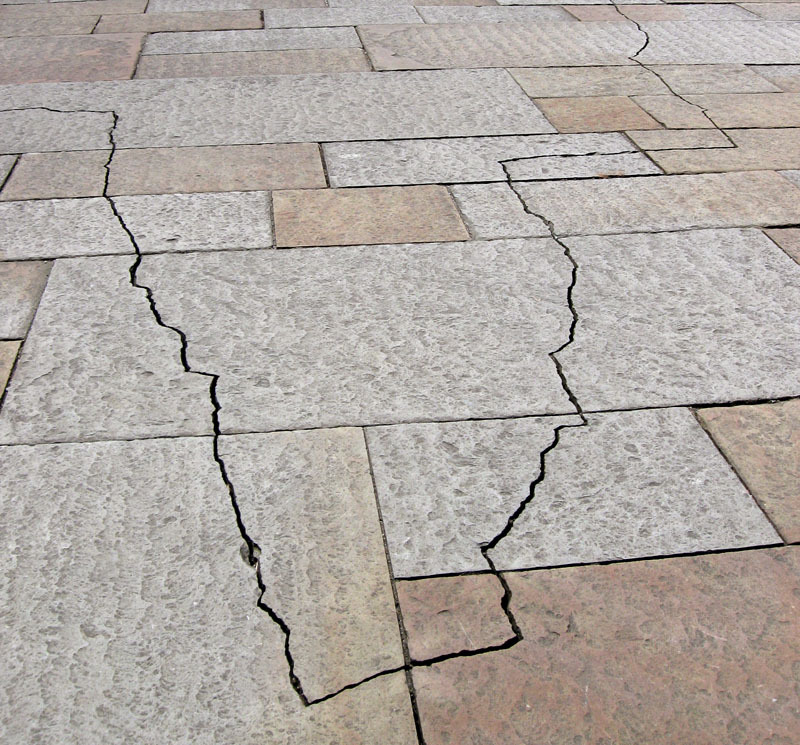 Photos of cracked pavers and slabs are below. I’m impressed by the ninety degree angles. 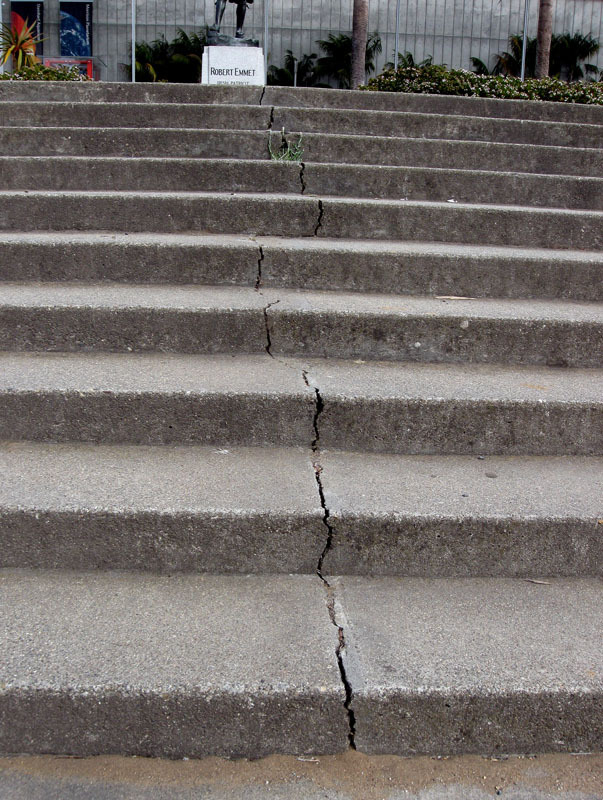 Cracks usually want to run straight. 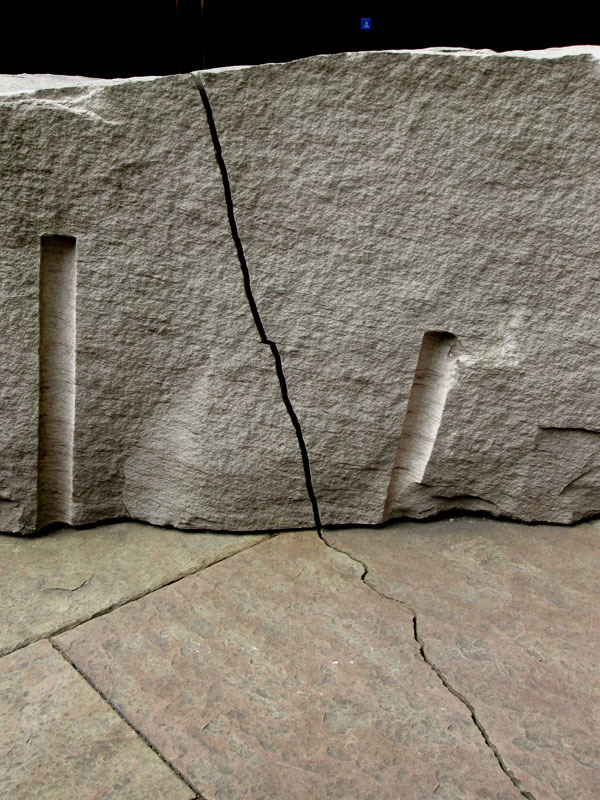 The drill scars from quarrying the stone. Drill scars up on one stone, down on the other. 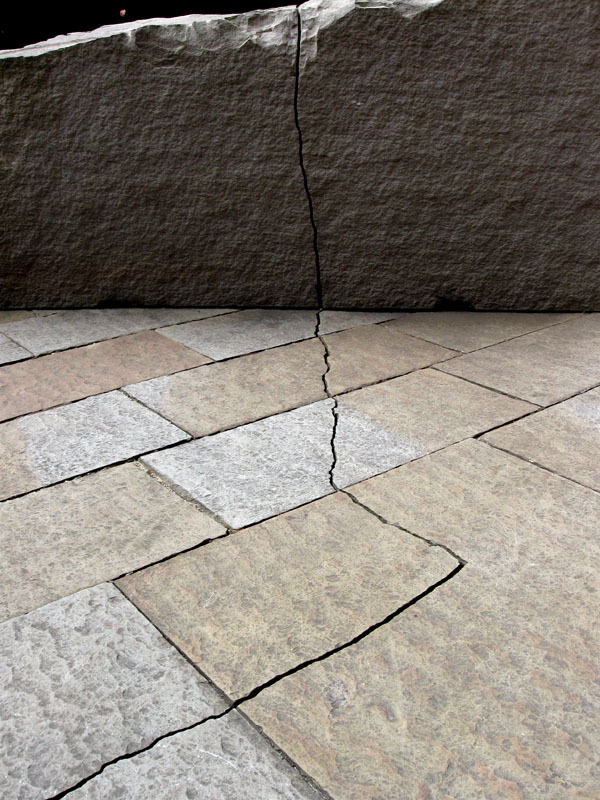 Directly across the plaza from the de Young is a cracked concrete staircase that is perfectly lined up with Goldsworthy’s crack. I think he would approve. This entry was posted on Wednesday, August 26th, 2009 at 6:17 am and is filed under sculpture, stone. You can follow any responses to this entry through the RSS 2.0 feed. You can leave a response, or trackback from your own site. Your entry makes me appreciate it a little more. Personally, I saw it as non-Californian tries to do earthquake-themed art, and I didn’t find it very convincing. I had assumed he had cut the stones. Breaking them is definitely more impressive. Welcome back from the mountains. Funny about Californians and reminders of earthquakes. There’s a little desert town on the other side of the mountains here that had the coolest name for years: Earthquake Valley. But the locals decided they didn’t like to be reminded of their home on the Elsinore Fault. So it’s now called “Shelter Valley.” Boring. One of Goldsworthy’s stone cairns has been a permanent feature outside the local contemporary art museum for a few years now. I’ll have to admit to admit that it’s impressively assembled, but it seems lost, out of context. The piece you show, though, is an amazing, complete environment. Great post, realy intresting photos.